When it comes to facemasks, there are two camps — the supporters and the skeptics. For me it depends on the claims, the price, and whether or not I’m feeling particularly swayable. I’m talking the clay-type masks here. The little sachets or tubes that come with the liquid you smear all over your face and get all over your hands, those masks. And then I went to Korea and was confronted with an entirely different phenomenon: the Sheet Mask. And then I’ve never really looked back since. So why, I bet you’re asking (even if you’re not I’m going to pretend that you did, sorry). Why? 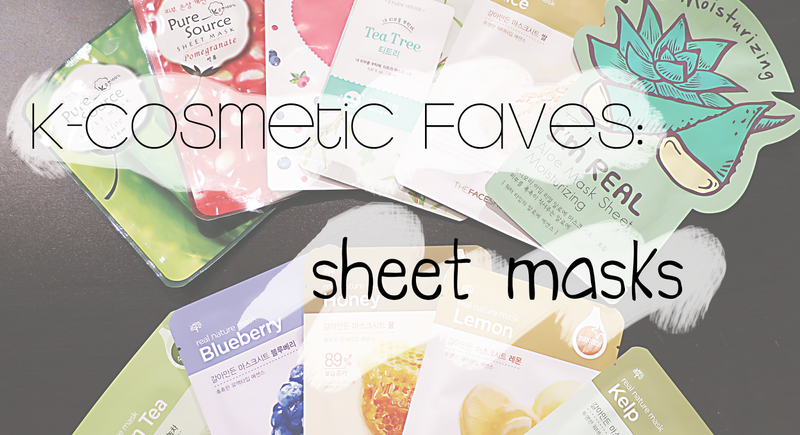 What is so special about these sheet masks? Well, for starters, I’ll go over what they are, since the format is a little bit alien, and a lot funny. Basically, in each little sachet you get a sheet that is soaked in liquid. The sheet has eye holes, a mouth hole, and a flap that covers the nose, but still allows you to breathe. They’re hilariously amusing when you wear them – and they’re probably not going to fit your face exactly. They’re a bit slimy when you first extract the sheet from it’s packaging, and this is due to the fact that the sachet contains the liquid the mask is infused with to keep it from drying out. The tiny little air spaces in the mask keep the sheet moist (ewww that word), and let the product transfer quite easily onto the skin. So, now that the technical side of things is out of the way, why do I like them so much? Well, for one, you don’t get the mask all over your hands when you apply it – so little product wastage. They’re super easy to put on and take off, so you don’t spend ages scrubbing at your skin once the mask is dry. They’re super hydrating, and a lot more natural. They’re also really useful to slip into your luggage on longhaul flights – no dry skin! In my own, personal opinion, I do believe that they work, but I’m not going to say they’re a miracle product. They’re great for a quick skin pick-me-up. I still think I used them most often as a nourishing product after a night out… club air isn’t the best for the skin. These 5 masks are probably my favourite of all the ones I’ve tried so far. I absolutely adore The Face Shop’s – especially the honey one. I use it if my skin feels irritated or like it’s going to break out, seeing as honey is a natural antiseptic. If I’ve already got breakouts, then I tend to use the Etude House Tea Tree masks. I buy them more often if they’re on a 10+10 offer (you basically get 20 sheet masks for 10,000won/£6. If my skin is feeling really dry, then I’ll use either an Aloe mask, or one of the berry ones. On the back of each pack are instructions and product information. I leave the masks on longer than the specified time of 20-30 minutes. If my face is having a majorly bad skin day, then I’ll sleep with them on sometimes, or wait until the mask is dry. Would you be willing to try sheet masks, or would you rather stick with the western style that comes in a tube? Not to say that there aren’t face masks and peels that come in tubes in Korea, but the sheet masks are definitely more popular. And cheaper. You can find a load of them listed on amazon, also on ebay and places like wishtrend.